Formed of Anam Abbas and Areeb Kishwar Usmani, the band and their first single live up to everything their name promises. ‘Maa Behn Ka Danda’ is an unbridled feminist punk song which is in parts, aggressive patriarchal critique; a repository of cathartic female revenge fantasies; and an exuberant celebration of righteous anger. This form of anger in normal societal terms can be seen as the heady feeling that is primarily both male birth-right and fodder. Wrapped up within our views of masculine and wrathful gods, anger appears to be heavily gendered, as perpetuated by patriarchy. From action film heroes to politicians, anger and aggression seem to be traits valued in men. It shouldn’t be hard to see why men try to monopolize rage: they take so much ownership of it. 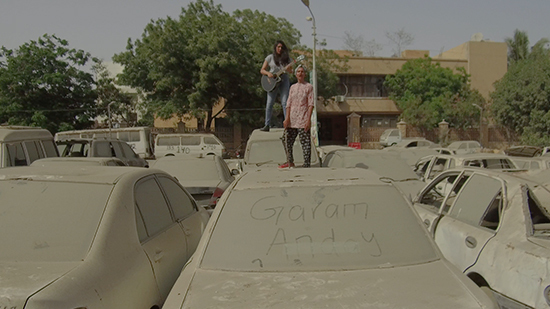 However, bands like Garam Anday offer a wonderful and visceral answer in the form of expressive female anger, in the same vein of the Riot Grrrl movement in the American punk rock landscape in the 90s. Punk has always been political. It was the rejection of everything that could be seen as oppressive, it was grounded in revolt of the prevailing system of disenfranchisement. A disillusioned class of youth rose up against authority and the establishment. Unsurprisingly, punk no matter how open and anarchic it was willing to be, fell into a structure of male control as well. Enter Riot Grrrl. The movement, led by bands such as Bikini Kill, was a revolt within the revolt. Riot Grrrl not only had a major influence on music, but society as a whole in that the way they affected change by addressing issues of femininity, anger, queerness and inspired a generation of women and non-masc people to be unabashedly angry and lay claim to their rightful share of rage. 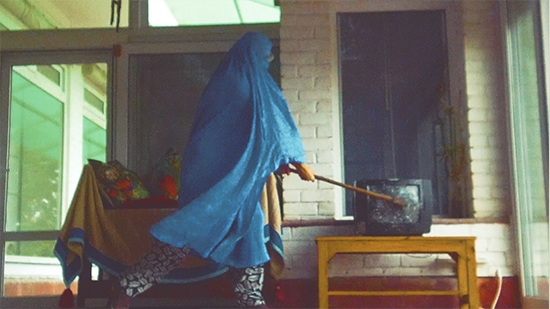 Garam Anday uphold this tradition of violent femme anger through ‘Maa Behn Ka Danda’ perfectly. The minor key power-chord guitar riff propels the song and is as unrestrained as the fury-fuelled lyrics. It is clear that the sound of the band and the spirit of their message is uncompromising. This is doubled-down in the independently produced and self-funded music video that features not only scenes of female rage and violent revenge fantasies against the gross facets of patriarchal society, but also the reclamation of public space by women. The band and song is entrenched in feminist activism: it was first performed live at the Aurat March 2018 in Karachi (the march spread across other major cities in Pakistan as well) which the band members and all the women featured in the music video were an integral part of. Another notable feature of the irreverence of the single and music video is also seen in its disregard for the “seriousness” of anger as ‘Maa Behn Ka Danda’ and its brand of female anger is unafraid of employing comedy in its aim for female catharsis. Not only is this an angry song, it is unquestionably, a fun one. Anam and Areeb found each other as Anam, who is also a filmmaker, was looking for female musicians to collaborate with for her indie web-series ‘Ladies Only.’ She ended up working with Areeb and while they may come from different places musically, they were able to converge on the idea for the band and the music they wanted to produce together. The band is influenced by a wealth of different music ranging from contemporary R&B, jazz, feminist DIY artists such as Ama Lou and Princess Nokia, and desi punk bands such as the Pakistani Punjabi punk group Bumbu Sauce. 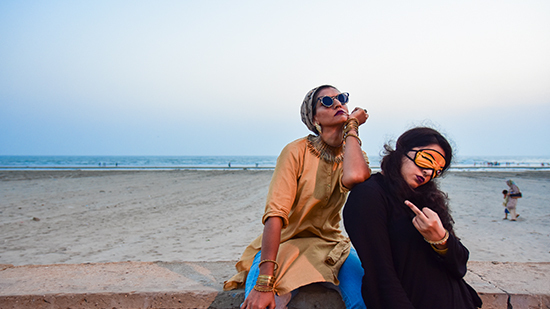 Their next single, which is called ‘Millenial Bahu’ has also been produced through this entirely independent and collaborative process and is expected to follow ‘Maa Behn Ka Danda’ soon. When asked what we can expect next, the band has teased us with a possible EP release in 2019 and local “ladies only” gigs being rolled out in cities in Pakistan. If ‘‘Maa Behn Ka Danda’ is anything to go by, we can be sure to expect exciting, explosive music; and iconic moments for not only female indie music in Pakistan but the desi music landscape as a whole.